Want to tone up, or just get healthy? Join the Body by Vi 90Day Challenge, and you will not only help yourself, but others too. Many of us are looking for a simple solution, an easy way to get in shape! Most of us have tried fad diets that left us bored, hungry, or spending hundreds of dollars on special foods. Or we bought exercise videos that didnt tell us anything about nutrition and arent targeted to special needs. 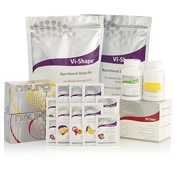 Now, ViSalus has created Body by Vi, combining our products along with our online and offline support tools. No one else can offer the same comprehensive program that includes a simple nutritional plan with recipes, menus, exercise tips and programs, and online community support. If youd rather not get weighed in public, or eat expensive foods, or be forced to go to the gym, this is the program for you. Body by Vi includes all of the tools, support, and products you need for an entire month! Our program allows you to join others online and learn exercise tips, recipes, menu planning and more. No one else provides the powerful combination of nutrition, support, education, and exercise like ViSalus! 30 days and 60 meals of fun, flavorful, body-shaping energy! Includes our Shape-Up Health Flavor Mix-Ins, so you can personalize your shake flavors with powerful nutrient benefits and rich flavor. Nutritional support to help you curb hunger, burn fat, and feel great from head to toe. Optimal support with a robust Omega Vitals blend that supports heart health, cognitive function, joint health, and more! Healthy energy and hydration, to help your body fight fatigue and stay energized. Online and offline tools to help you stay on track, meet new friends, learn new ways to eat, and get all the support you need at your fingertips anytime day or night! Join the challenge online, register today! 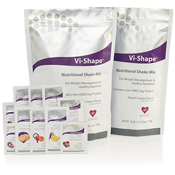 Get our specially priced Body by Vi Shape kit  One kit lasts 30 days, and has 60 meals! Have others join and work out together, and keep on track. Send us your before and after pictures and your testimonial! Help shape your body with 60 power-packed meals.